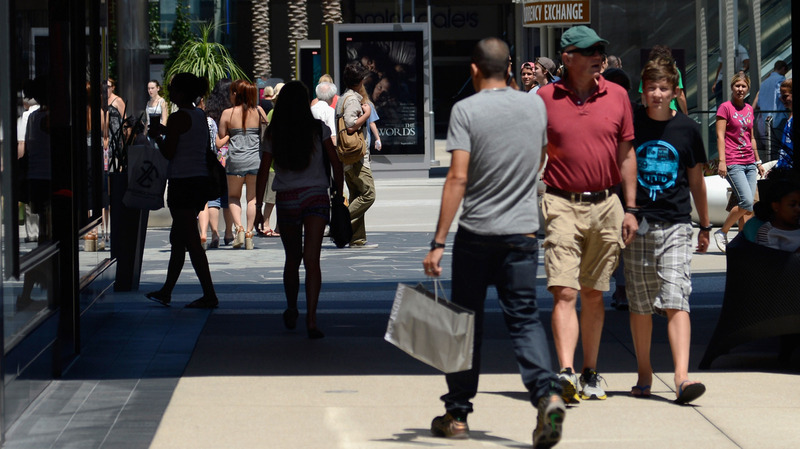 Consumer Spending Jumped Up In September : The Two-Way There was a 0.8 percent rise from August to September. Since consumer spending accounts for more than two-thirds of economic activity, it is crucial. Hitting the mall: Spending rose in September. "Personal income increased $48.1 billion, or 0.4 percent," in September from August, the Bureau of Economic Analysis says, while "personal consumption expenditures" — consumer spending — rose 0.8 percent. "The spending gains reflect in part rising consumer confidence. The University of Michigan reported Friday that its final consumer sentiment index for October had hit a five-year high. Falling gas prices and a slightly better job market were credited with lifting consumers' outlook. "With eight days until the election, the economy is being kept afloat by a revitalized consumer and the early stages of a housing recovery. But the nation continues to struggle because businesses are reluctant to invest, and slower global growth has cut demand for American exports."